Heat oven to 450°F. Place corn in large bowl of warm water to partially thaw. In ungreased 15x10x1-inch pan, arrange sweet potatoes and onion around sides. In 1-quart saucepan, mix glaze ingredients. Cook over low heat, stirring constantly, until melted and smooth. Brush about half of glaze over vegetables. Roast uncovered 25 minutes. Remove vegetables from oven. Turn vegetables in pan. Remove corn from water; place in pan with vegetables. Place pork tenderloins in center of pan. Brush pork and all vegetables with remaining glaze. Return to oven; roast uncovered 25 to 30 minutes longer or until vegetables are tender, and pork has slight blush of pink in center and meat thermometer inserted in center reads 160°F. Slice pork. Arrange pork and vegetables on platter. Garnish with Italian parsley. One whole pork tenderloin is usually about 1/2 to 3/4 pound. For this recipe, 2 large or 3 small tenderloins will yield the 1 1/2 pounds necessary. 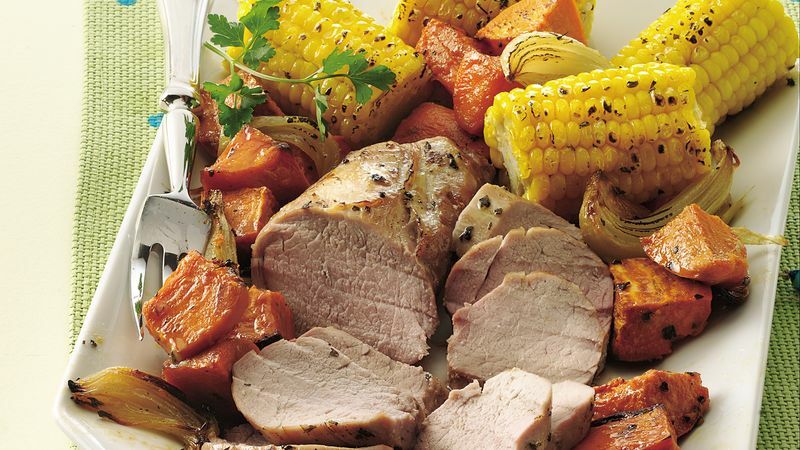 There's no waste with pork tenderloin; it's very lean and tender.